Declaration of Initiative Committee "Save the Condritsa forest"
The Massive wood felling was begun in the forest near village Condritsa in December 2003 as a command of State Chancellery of Republic of Moldova. The cuttings are proceeding with the violation of environmental law including international Conventions, without state authorities permission and without public participation from the nearest territories. Until now about 2,4 wood hectares were cut and 112m3 of wood were obtained. Forest belt in width of 3 meters and length more than 10 km is using for creation of a protective fence from concrete and wire around of resting complex "Condritsa" which is at the disposal of the General Direction for administration of buildings State Chancellery. Through this action is roughly broken the legislation of Moldova - clauses 78 and 80 of Wood Nature protection Codes. According to these clauses reduction of the areas of wood fund and forest landfall is strictly forbidden, and guilty persons are called to civil and the criminal liability. The State Chancellery has roughly broken the legislation, carrying out the Decision ? 222 from the 27th of May , 2002. The legislation does not resolve removal of the ground areas covered with a wood from wood fund and realization of capital construction on the given sites and provides the subsequent penalizing. Also uncontrollable cutting down of trees is especially forbidden. In the heart of a wood "Condritsa" deforestation and installation of wire and concrete fence divides a large forest into two parts. It will put a huge irreparable harm to this natural zone of exclusive value, natural balance collapses, destroys biodiversity! 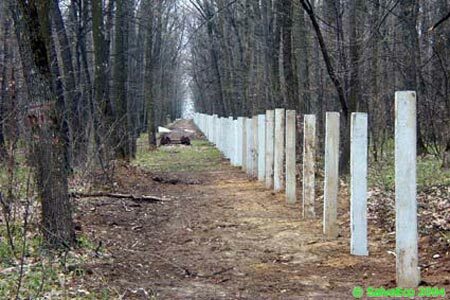 When Europe supports creation of ecological corridors between the large forests, which are taking place far apart, governors of Moldova create artificial borders between existing natural zones. More than 500 hectares of woods it is hedged for not clear purposes (neither the population nor experts did not see the project on this question). The given illegal actions return medieval traditions when natural riches belonged to one family in our country or the small group of people was owners of the whole forest, and other poor population has been deprived access rights on this territory. Public committee "Save the Condritsa forest", created by a group of nongovernmental organizations, acts categorically against cutting down of large forest Condritsa and demands an unconditional stop of all above-stated works in a large forest. The committee asks from the Central authorities on environmental protection to stop deforestation, construction of a fence, to investigate an incident and to do responsible guilty persons according to the current legislation. If the governments will not take appropriate measures, the public committee will bring an action to judge against the State Chancellery. We demand cancellation of the decision of the Government ?666 from the 27th of May, 2002 with the subsequent penalizing. Also we demand to cancel the certificate about transfer to using the State Chancellery 507 hectares of woods, which concern to State Forestry Skoreni of Wood Enterprise Stresheni. All means intended for construction of a fence to be transferred to forestry for improvement of protection of a wood. We address to the nongovernmental organizations and citizens of good will of all country and from abroad to be in solitary with our protest and to participate in other actions directed on a stop of process of transformation of wood Condritsa in the closed natural zone for entertainment of group of elite functionaries. Our purpose is to protect interests of the nature and all society! Members of public committee "Save Condritsa forest"